Successful blogs are built on a whole lot of passion and even more hard work. I love sharing blogging tips and tricks I’ve learned along the way and one of them is to snag the best Black Friday deals for bloggers so you can skyrocket your blog in 2019 and keep more income in your pocket! You may have started out blogging as a hobby but once you decide to blog for income, it can be expensive to secure all the tools you need to grow and succeed to make your work from dreams a reality. I will be updating this post as sales go live each day (or when I’m allowed to share sale info) so stay tuned and check back often! It’s so easy when you’re dreaming big to take on too many goals. I’m the worst at biting off more than I can chew. In 2018 I discovered some tools that helped me dream big for my blog while still achieving my most important goals in my home life. I used the Powersheets Intentional Goal Planner* by Cultivate What Matters for the first time in 2018 and was astounded at how it helped me uncover the goals most important to me, unravel my deep rooted fears, and crush my self limiting beliefs so I could get out of my own way and get things done. I was encouraged by the Cultivate What Matters team who inspired me to grow slow, savor the journey of achieving my goals little by little and recognizing that progress is better than perfection. 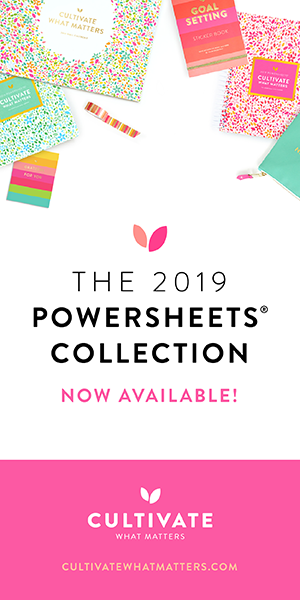 I’ve written a very honest review of Powersheets here and Everything You Need to Know About Powersheets 2019 which will help you decide if it’s right for you. Cultivate What Matters is an insightful and powerful shop, besides the Powersheets, they have encouraging gifts like Write the Word journals to cultivate your faith, goal guide workbooks for finances, wellness, parenting and couples, gorgeous cards, calendars and stationery. All their products are designed to inspire and motivate women to cultivate what matters in their lives. So be sure to check out everything in their shop to see what’s on sale! 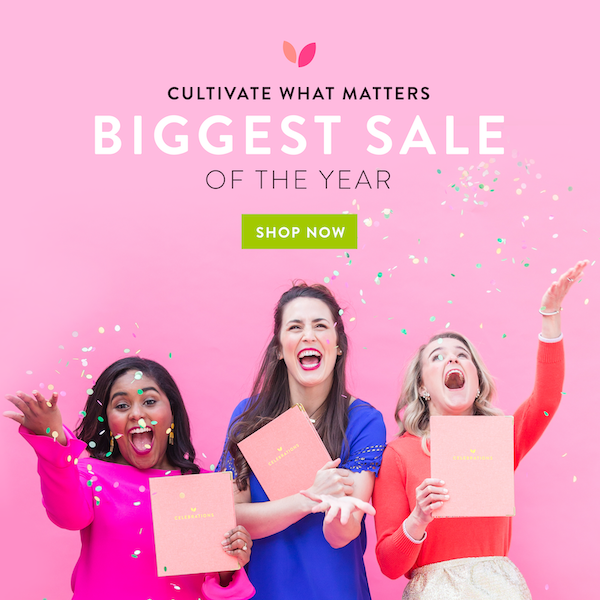 Cultivate What Matters’ biggest sale of the year starts on Tuesday, November 20, 2018 at 10am EST with items up to 50% off in the Cultivate What Matters shop*. If you are a first time user, my recommendation is to snag the Make it Happen Bundle with the 2019 Powersheets, the Goal Setting Sticker book, and the Make it Happen Zipper Pouch and a copy of Lara’s book Cultivate: A Grace-Filled Guide to Growing an Intentional Life which I read in 2018 and will use for journaling prompts too. I’m a total planner addict and I love reviewing and comparing planners to help you figure out which planner is the best for your needs. While Powersheets is a goal setting planner, you still need a life planner to schedule specific tasks into your day. Here are my planner recommendations and the best Black Friday deals for bloggers coming this week! These shops all have fun accessories, cards, stationary and gifts available too for sale in their shop too. I have been obsessed with my Watercolor Floral Daily Simplified Planner since I started using the academic version in August. When I did my prep work in my Powersheets for 2018, I set SIMPLIFY as my word of the year. So many times I get overwhelmed because I make things more complicated than they need to be. I expect things to be perfect and come up with these grand plans that I just can’t quite keep up with. So the Simplified Planner really has helped me pare things down. Being physically smaller than the Purposeful Planner and Passion Planner I was using earlier this year, it forced me to only write down the most important tasks of the day. Having more note space allowed me to document better my health as my Rheumatoid Arthritis and other autoimmune problems. Color coding my tasks with their pens and color coding stickers has helped me make sure I have a good balance in my day and know how to best make use of my time. 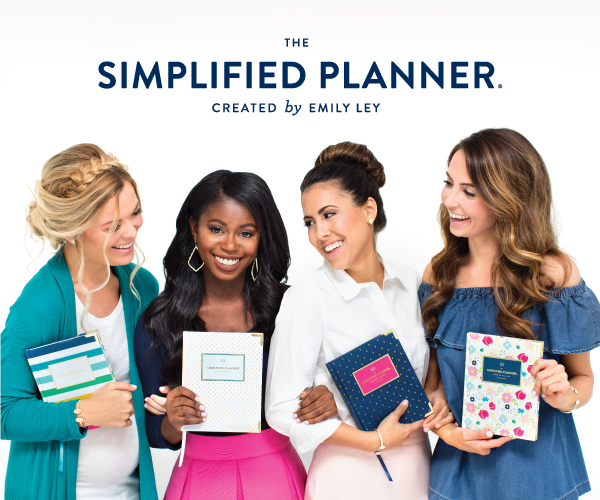 Check out my full review on the Daily Simplified Planner here if you need more information about whether this planner is right for you and in my ultimate planner comparison of how it compares to other planners on the market. Besides the Signature Simplified Planners in both daily and weekly editions, Emily Ley’s shop sells coordinating Pilot Precise Pens*, sticker packs, accessories, apparel, journals and various binder systems to manage your home and memories, beautifully and simply. I’ve read her book Grace Not Perfection already and have a Simplified Life on my shelf to read and really want her new Simplified journal* and SIMPLIFY page markers* for my 2019 planner! Emily Ley’s shop* sale starts on Thanksgiving Day, Thursday, November 22, 2018 at 7pm EST and ends on Monday, November 26, 2018 at 11:59pm EST. So many great items are on sale! The Day Designer* is a gorgeous spiral bound daily planner and leather ring binder system with excellent goalsetting worksheets and dedicated space on the daily page to track your top 3 priorities, schedule, to dos, health, gratitude, due dates, dinner plans and notes. If you have busy days with lots of tasks to manage like having the spaces to fill in as a visual reminder, then you’ll love the Day Designer. Their product line really has a planner to suit all types of planner needs and budgets, from their economical weekly and monthly planner line for Blue Sky to their Flagship line and Luxe Binder Line daily lines for a more professional look, to undated Today & To Dos for extra busy days of note space. You’re sure to find something classic to help you plan a well-designed life. You can check out my full review of Day Designer here from when I used it in 2016-2017 and in my ultimate planner comparison of how it compares to other planners on the market. The Day Designer planners don’t typically go on sale before the new year starts but they do give us FREE Shipping on domestic orders over $49 until Monday, November 26, 2018 at 11:59pm PST. They do priority shipping which can be expensive so definitely take advantage of the free shipping deal if Day Designer is the right choice for you. 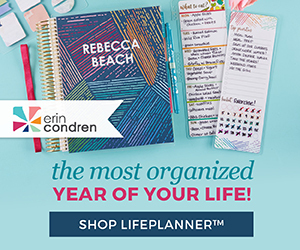 Erin Condren’s life planners* was the first planner I truly loved. With beautiful artistry and high quality paper, fun stickers and binding, Erin Condren makes a wonderful product that you just can’t wait to look at every day. And the more you look at it, the more it will inspire you to get things done. I’m sure you’ve seen people go crazy for decorating their Erin Condren planners, they really do inspire creativity. But I’m a pretty functional planner, so I used the minimum of colored pens and the stickers that came in the planner and was still hooked. And her product line has grown so much to offer more options for all planner types: hardbound, teachers, wedding, yearly, monthly, quarterly and the new Petite Planners* for ultimate portability in a travelers style notebook. 30% off SITEWIDE starting November 23, 2018 through November 27, 2018! Time to stock up on life planners, wedding planners, petite planners* , accessories and unique personalized gifts for teachers! Since starting Elite Blog Academy*, I’ve been a big fan of owner Ruth Soukup’s products. Every webinar, printable and course I’ve taken has helped me. The Daily Productivity Guide I got with EBA helped me figure out what I wanted for my dream life, not what I thought I had to do but what I wanted to do. So I’ve had my eye on Ruth’s Living Well Planner. Ruth brings the same goal-setting and goal-crushing strategy and bright, uplifting colors from the Daily Productivity Guide into this planner. If you like a spiral-bound weekly format that has space to juggle your work and mom life with sections for menu planning and budgeting, check out the Living Well Planner*. I also like that it is undated, so you can start using it anytime (though it has been known to sell out). I’m hoping to get one so I can do a full review of it in 2019. Ruth is also a best selling author of books on blogging, decluttering and living well spending less. Her books and several of the productivity books she’s read and recommend (like Total Money Makeover, the Magic of Thinking Big, the One Thing and Eat That Frog) are also on sale in her shop for Black Friday. I LOVE book bound planners and fell in love with the Passion Planner* in 2016, the first planner I found that focused on identifying and pursuing our passions in life. I loved that the to do list space was broken down equally between personal and work to dos for a visual reminder to maintain a work-life BALANCE. I loved the monthly goalsetting and reflections and I loved that it had enough notes pages in the back that I could bullet journal my collections and massive to do lists into it. The Passion Planner is my favorite weekly bookbound planner. Please note, the planners in the picture are mine from 2017 and 2018 (purple is a compact size and teal and pink are compact size). There are still a limited supply of undated planners in these sizes but in 2019, all planners are an in between new Pro size (7 x 10 inches). Get 50% off all undated and academic Passion Planners* starting 11/23/18 and ending at 11:59pm PST on 11/23/18. On Monday, November 26, 2018, get $10 off 2019 Dated Passion Planners* from 8am-1pm PST only and $5 off 2019 Dated Passion Planners from 1pm-11:59pm PST. Can you believe 2019 is just around the corner? Get a jump start on your blogging goals and plan out your editorial calendar with my FREE 2019 Blog Planner that you can use on Google Drive, in Excel or print from a PDF. Make sure you subscribe to my newsletter to get access to this planner and other exclusive subscriber freebies, printables and deals news. A couple years ago during Black Friday, I switched to New Blog Hosting* upon some fellow bloggers’ recommendations. Besides the absolute steal of a price I got, owner David Allen personally handled the transfer and every other panicked email I sent him since then that “I broke my site” or “my site is down” with speed, precision and professionalism. I love the personalized service he provides and that I’m not just a number like with the other big hosting companies who didn’t care when I jumped ship. And New Blog Hosting is a way better value!!! Get 20% off all New Blog Hosting services* now through January 2, 2019 using the code BLACKFRIDAY2018!!! They provide wordrpress/blog hosting, daily backups, free migration, DNS management and much more complicated services and servers than I understand. Bluchic* is a design company that I use for beautiful, feminine but professional premade landing page and social media templates (you can see an example in the pin image I made above or head over to my Pinterest blog board to check out others I’ve done). There are 17 different categories of social media templates to choose from and with 5 design options per category, you are sure to find something that will work to customize for your audience. As a devoted Picmonkey user, these social media templates actually got me to love Canva! Templates make it sooo easy and efficient to create gorgeous images that work to bring attention to your blog. They also offer stunning WordPress themes and other design elements for a cohesive brand.I highly recommend the landing page and social media templates have saved me so much time and taken the guesswork out of beautiful design. Get 30% off all Bluchic’s WordPress themes and design templates in the Bluchic shop* until Monday, November 26, 2018. I just snagged this Black friday deal from App Sumo for DepositPhotos* because I need high resolution stock photos. I already have some from Jana Bishop which are muted, classic, and elegantly styled, they are the kind of photos I am most drawn to. But I want another set of eye-catching, colorful and vibrant photos so I can see what my audience likes better on the blog and Pinterest. So I got the DepositPhotos deal, 100 photo credits for 90% off! I’ve heard rave reviews about these photos and you can use them royalty-free for commercial purposes on your blog, social media and products as long as you don’t resell them. Considering I’m trying to do 5 different pin images per blog post, I need a LOT of images! Get 100 Photo/Vector Downloads from Depositphotos* for 90% off! If you need more than 100 images, you can purchase and stack as many codes as you like! Tools to Learn from the Best and Skyrocket Your Blog’s Success! 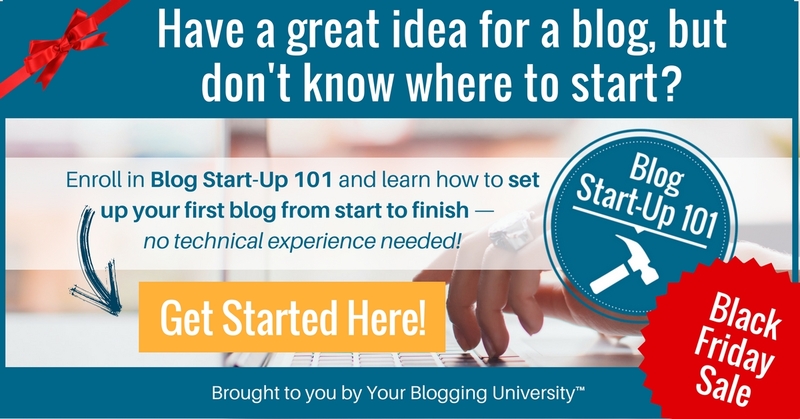 Blogging courses you won’t want to miss! I love taking blogging courses to expand my knowledge and learn lessons from bloggers who have already found proven success. Here are some of the courses that are the best Black Friday deals for bloggers. Elite Blog Academy is coming! Elite Blog Academy* (EBA) is coming in 2019 and is usually only on sale for like one week all year long. I don’t know when the sale will go live but I’m warning you to get on their mailing list* now if you might at all be interested so you don’t miss the sale announcement. Sometimes the cart opens only to people already on the email list! If you don’t already know, EBA is the most comprehensive blogging course I’ve invested in, taking me from thinking about my blog’s mission to turning the blog into a profitable business. Leading up to the launch of EBA, the freebies and webinars will be pouring in too, so you’ll want to get on the mailing list now* so you can at least grab the freebies like 7 Surefire Ways to Boost Your Blog Income Overnight* and The Blog Structure Blueprint*and blog-changing advice that Ruth and her team provides. I’ve already made back 5 times the price I paid for the course! You can check out my honest review of EBA here and my answers to the most frequently asked questions I get about EBA. All of Crystal Paine’s courses* are on sale 50% off this Black Friday, both for her blogging university site and her Money Saving Mom site! The following are the courses she offers on blogging and the sale prices. What I love about Crystal’s style is her down to earth and humble teaching style. She recognizes we are all in different seasons and she’s gone from rock bottom to a best selling author and highly successful blogger and everything in between. She gives us practical, actionable advice to implement what’s best for us. Truth be told, I haven’t taken any of her blogging courses yet because she started offering these courses after I had already taken much more expensive courses on the same topics. But I think her courses are perfect for new bloggers because they are reasonably priced and are bite sized and value packed so they give you a good foundation to the topic without overwhelming you. She also offers some productivity courses for moms which I have taken (see bottom of the post for the 50% sale on those too). All of Crystal Paine’s courses* from Your Blogging University and Money Saving Mom are 50% off using the code BF2018 now through Monday, November 26, 2018. Lena from Adventures in Blogging* is a former CPA turned SAHM with 3 kids turned highly successful blogger. We have much of that in common, but I’m still working on the highly successful blogger part. Anyway, I’ve taken several of Lena’s courses and am excited about Adventures in SEO starting up next week. Lena is an expert in growing traffic, Pinterest and SEO and teaches us what works in video and text courses that are detailed, organized and backed by data (exactly what this CPA turned SAHM likes and needs too). Her courses dive deep into a particular topic so are more suited to people who have started a blog and want to see it’s traffic explode! She is also offering 50% off when you buy the bundle containing the first 6 in the list above! I have all of them I think except for the Ebbok Creation Guide and the Ebook & optin freebie templates, so you can guess which 2 are going in my cart! Adventures in Blogging* has 40% off 7 of it’s individual courses and guides when bought separately off using the code BF2018. Or buy the bundle of 6 of the courses for 50% off! Now through Monday, November 26, 2018. I’m a big fan of Melissa at Blog Clarity* and her courses, in fact I’ve taken 3 out of 4 of them. Melissa is a wonderful teacher, explaining difficult concepts in an easy to understand manner and with a bit of humor. Classes are concise and incredibly helpful with valuable printables that summarizes important information well. Melissa set up Facebook groups where we could ask her questions directly during the class and is very responsive. Melissa updates her courses as Pinterest algorithms, blogging best practices and technology changes. Since we get lifetime access to the courses we purchase, we can always access the newest information and get a refresher on the lessons. How awesome is that? I love being able to take the updated course when I need to without having to pay for it again! I love that Melissa’s courses are reasonably priced as well. With all the course video walk throughs and workbooks to help you think through and manage the content, Blog Clarity’s courses are an incredible value for what you get. I loved the Content Brew* class I took years ago and my editorial calendar is full to the brim with ideas to write about. Content Brew is now a self-paced course which means you can take it on your own time and as it fits your schedule. I love that she helps us take our ideas and atomize them to generate countless more ways to promote on social media and future blog posts. Melissa’s ideas are actionable, practical and easy to implement. If you need more content ideas, then definitely grab Content Brew when it is 20% off! Content Brew* and all other Blog Clarity courses (including payment plans) is 20% off through Monday, November 26, 2018 using the code BLACKFRIDAY18. If you’re new to my blog, maybe you haven’t heard me gush over how Pinning Perfect brought me 1,899% growth in blog traffic from Pinterest alone! But it’s true, Pinning Perfect* was one of those game-changing courses I took. This course is for those who are new to Pinterest and takes you from setting up your account properly to designing eye catching pins to keyword research and getting them live to Pinterest the right way. Pinterest is still one of my top traffic sources, fighting with search for the top spot and has made a significant traffic impact on my blog. You can get a FREE Pinterest Holiday Keyword Cheat Sheet now* but Melissa is giving away some amazing bonuses with Pinning Perfect purchases this week on top of the ones already in the course, including a Pinterest guide, and gift guide templates you can use. Pinning Perfect* and all other Blog Clarity courses (including payment plans) is 20% off through Monday, November 26, 2018 using the code BLACKFRIDAY18. I completed Media Kit Smash* last year and again loved it. This course is not as intensive as Content Brew or Pinning Perfect but it’s a powerhouse of actionable steps to get your kit done. It will help you get the attention of brands and partners with a rocking media kit. Melissa walks you through creating a kit on Canva and gives you 8 free templates to get you started in the right direction. I am excited to get my media kit out there and let it do it’s magic to bring me new income opportunities. Media Kit Smash* and all other Blog Clarity courses (including payment plans) is 20% off through Monday, November 26, 2018 using the code BLACKFRIDAY18. Monica at Redefining Mom is an excellent and very detailed and thorough instructor. Just like Melissa of Blog Clarity, I’ve purchased almost every course she’s offered because they are an incredible value for the price. Most recently, I purchased her Pin Practical Masterclass* and Pin Practical Promotions* courses. As I said above, Pinterest is one of my largest sources of traffic and I really want to optimize it more. These courses will not only help me take advantage of bringing Pinterest users to my blog, but to my email list and products as well. I’ve toyed with becoming a Pinterest VA so I know that having these two courses in my arsenal will help me accomplish my goals for my own blog and hopefully potential clients as well. Let’s hope Amazon has some great deals on these must have tech gifts this Black Friday! These are the tech gadgets I use and they have really helped me improve my picture quality and blogging efficiencies and capability. I’m a huge fan of Apple products now and they certainly make blogging easier! I also need a new terrabyte external hard drive* for storing photos I’ve taken and downloaded from my stock photo subscriptions. I’ve got each of these books to read and of course, the Kindle Paperwhite, to help me read blogging books late into the night and wherever I am. The truth is many of us can’t dedicate 100% of time and energy to achieving our dream life. We have tons of roles to juggle, an overwhelming to-do list and less and less time to get it all done. We need ways to simplify our lives so we can dedicate more time to chasing our dreams and having fun! In case you missed it above, I’m a fan of Crystal Paine and inspired by what she’s accomplished from struggling to make ends meet to running highly successful businesses we all dream of. Crystal has always been generous with her time, talent and knowledge and passes it on to us in her courses. I’ve taken 4 Weeks to a More Productive Life* and loved how Crystal speaks to us honestly from her struggles, and what we can learn from her experiences. She encourages us not to copy her way, but gives us the tools we need to think through what will work best for us, in our current season of life. 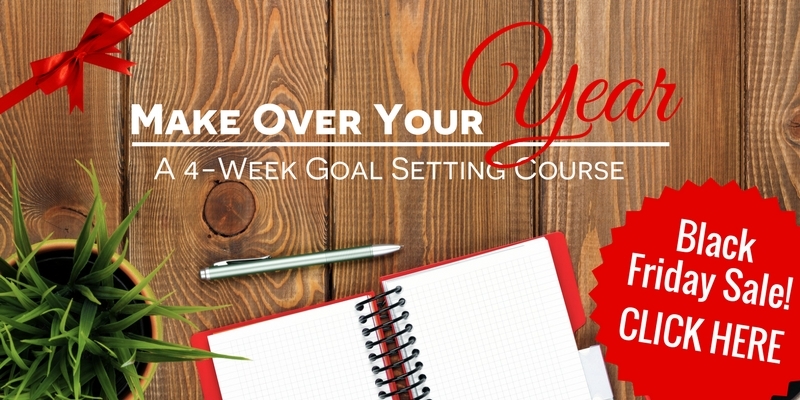 I’ve also bought Make Over Your Year* and can’t wait to dive into it. I’m always looking for ways to improve my outcomes for a productive and happy year! At 50% off, these courses are a steal and might just give you the boost of encouragement and motivation you need to fine tune your routine and rock the new year! “Mom, what’s for dinner?” How many times do you get asked that in a week? I always need an answer to that question. Menu planning has become a necessity for me, both so I know the answer to that dreaded question and so I can plan my energy and day accordingly to ensure a good meal is on the table to nourish my growing boys. Plan to Eat* is the menu planning tool that I have LOVED for the last two years. Since I’m a total Pinterest addict, I save recipes I want to try to my boards. Then when I’m ready to try it, I copy and paste the link into Plan to Eat and click “import or search” and Plan to Eat pulls the recipe into the planner so I can save it. Then I find the recipes I want to make for the week and drag them into the planner. Once the week is filled in, I click the “shop” button at the top and ta-da, my shopping list is created for me. Plan to Eat puts a letter code next to the recipe in the sidebar and a corresponding recipe letter for each item in the shopping list. Plan to Eat even puts the items into the sections where they are found in the store. You can easily add or remove items from the shopping list and then print it up. Simple menu planning done with a few clicks. Get 50% off Plan to Eat* annual subscriptions from Monday, November 26, 2018 through Sunday, December 2, 2018. My friend Rachel at Smart Mom Smart Ideas has a great printables shop to help you manage your time, organize your life and eliminate overwhelm. I especially love her gratitude journal, blog marketing planner and Smart Mom Smart Mornings Bundle to help develop an effective morning routine. Rachel’s printables are encouraging, classic and inspiring and can help you in many aspects of your life, from self care to faith to cleaning and blogging. You’re sure to find something that will help you. Everything in Rachel’s Smart Mom Life shop is 25% off with the code THANKSGIVING until Friday, November 23, 2018 at midnight EST. Another friend Alison at Organized Motherhood also has a printables shop dedicated to helping moms simplify their overwhelming lives with pretty and fun printables to help manage the chaos. I especially love her bright and colorful kids back to school planners and chore charts, her setting routines workbook with brain dump worksheets and her Ultimate Guide to Menu Planning and the Time Blocking page because I love to time block my day to stay on track. Everything in Alison’s Organized Motherhood shop is 25% off until Tuesday, November 27, 2018 at 12:00am EST using the code Thankful. You can also get her November gratitude journal for FREE using the code Grateful. Well there you have it, the best Black Friday Deals for Bloggers so that you can skyrocket your blog in 2019 and crush your goals! I am super excited to share some of my favorite tools with you, the ones that can truly make a difference in your blog as they have for mine. What are your favorite blogging tools that help you maintain, design and grow your blog?